Amicus practice is most prevalent at the highest court in the land with the number of amicus briefs being routinely filed in the Supreme Court dramatically increasing over the years. The vast majority of the cases that make it to the Court’s oral argument calendar are now accompanied by at least one amicus brief, in approximately 90 percent of cases. In the last fifty years, while the United States Supreme Court has not increased its output of opinions, amicus filings have increased more than 800 percent. Amicus briefs are filed at a rate of 500 per year in that Court. Amicus practice isn’t just confined to the United States Supreme Court. The amicus brief appears with regularity in federal courts of appeals and also in state supreme courts and state intermediate appellate courts. There is even some amicus practice in trial courts, both federal and state. 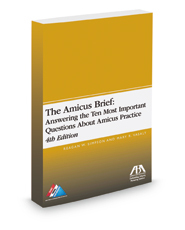 Topics range from how often amicus briefs are filed, who files, and why, as well as how to file and respond. The appendix contains reprints and excerpts from thirteen outstanding amicus briefs by top names including: Professors Tribe and Rains, Pamela Stanton Barron, Roger Townsend, Reagan Simpson, and Karen Grundy. These sample briefs illustrate what the court desires from an amicus brief, how to craft a brief that is witty and inventive, and how to inform the court of the ramification of a potential ruling.